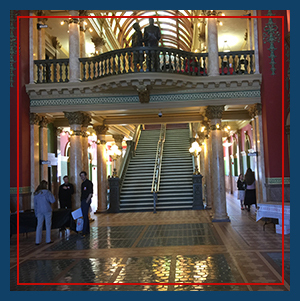 Stay informed about legislation, awards, new programs, and membership information. Please return to our News page often for the latest. Battelle for Kids and NREA are looking for dynamic presenters to positively impact attendees by sharing research, stories, resources, and ideas around this year’s theme, Leading Rural Together. All those who have an interest in presenting can register online. Please visit our Convention & Research Symposium page for more information on the convention. Help us build a national effort to attract and retain talent in our rural schools and communities! We are gathering input from rural teachers and community members from across the country to help us develop a nationally coordinated strategy for recruiting educators into our diverse rural communities. Are you interested in helping us address the growing teacher shortages facing our rural communities? Your voice matters! Visit the rural survey website to learn more. Then submit our survey to share your ideas and feedback. 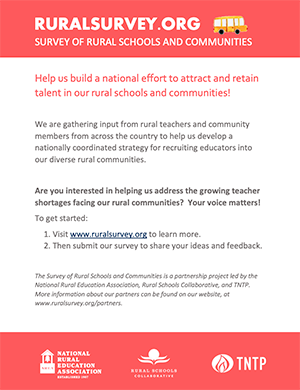 The Survey of Rural Schools and Communities is a partnership project led by the National Rural Education Association, Rural Schools Collaborative, and TNTP. You can find our more information about our partners by visiting the Partners page.